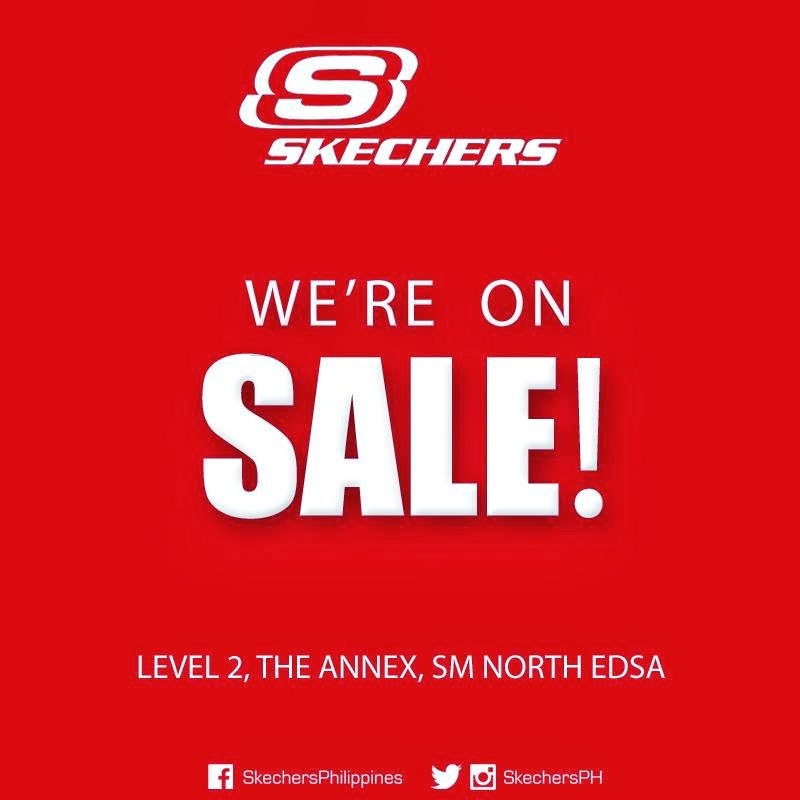 Come and visit the Sketchers Store on SALE at 2nd Floor SM City North Edsa The Annex today and get that fab sporty gear on sale ! SKECHERS, an award-winning global leader in the lifestyle footwear industry, designs, develops and markets lifestyle footwear that appeals to trend-savvy men, women and children. Do you have the Guts? Think you can conquer any physical and mental strain of an obstacle race? If you think you are tough enough to run and be on the top. Join and register the first Guerilla Sprint - Guerilla Race Challenge and win cash prizes for those 3 top winners on each category. You may register at www.guerilla-race.com. Guerilla Race Sprint 2014 will happen on February 23, 2014 at Nuvali, Sta.Rosa Laguna. The TrueNorth Guerilla Race® Series is the first obstacle-driven race series of its kind in the Philippines. Developed by a Philippine Army scout ranger, the Guerilla Race® Series is meant to test the participants’ limits in terms of endurance of body, presence of mind and resilience of spirit. Water, fire, mud, spider nets, barbed wires, high walls, tunnels and other bizarre challenges are leagues beyond the usual fun run trails. The TrueNorth Guerilla Race® Series is all about the very obstacles that beef up exciting landscapes and various race topographies in different regions of the Philippines. The TrueNorth Guerilla Race® Series offers a progressive race course, with four venues of varying distances and difficulty levels. Each leg of the series is devised with terrain-inspired or venue specific obstacles, all guaranteed to surprise the participants and to ignite their sense for strategy. Registration is until February 15, 2014. Registration Fee is Php 800. So what are you waiting for, show us what you've got. Register Now! Visit www.guerilla-race.com for full details of the event and Guerilla Race Facebook page for latest updates. Looking for a Job? 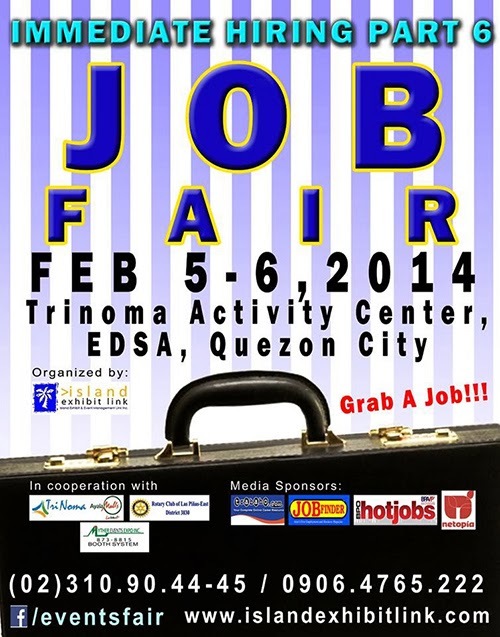 Islandexhibit link are inviting all jobseekers out there to come and join the Immediate Hiring Part 6 Job Fair on February 5-6, 2014 at Trinoma Activity Center, EDSA, Quezon City. There are different of companies from different industries to choose from. So update your resume now and grab this career opportunity just fits for you! 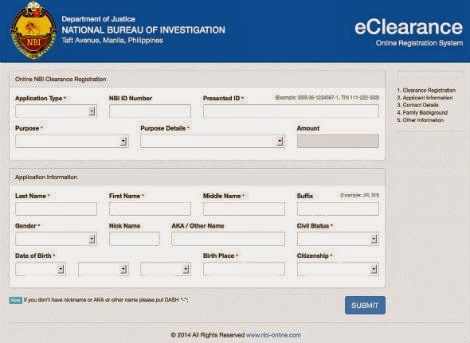 Good news for National Bureau of Investigation (NBI) clearance applicants because application is now available online! The new NBI online clearance system has been launched on Friday, January 24 at the websites of the National Bureau of Investigation and the Justice Department that aims to eliminate the long queues at the bureau's clearance centers nationwide. This will mean that you no longer have to wait for about two to three hours before you get to first step of the application. All you have to do is visit www.doj.gov.ph/nbi or www.nbi.gov.ph and fill-out information needed. A registration code and the application form will be given to user which will be presented in NBI clearance centers. Yes, you are still required to go to any NBI center for the payment, pictures, biometrics enrolment and issuance. Convenient, right? If you don't have any online access, need not to worry as the agency will soon put up kiosks in malls where clearance applicants can register online. Visit www.doj.gov.ph/nbi or www.nbi.gov.ph now. For faster transaction, make sure that you bring at least two (2) Valid IDs and make sure to follow the appropriate dress code allowed in the NBI Clearance. The most important we can give you is please "Be on Time"! on your schedule of your appointment in processing your NBI Clearance. 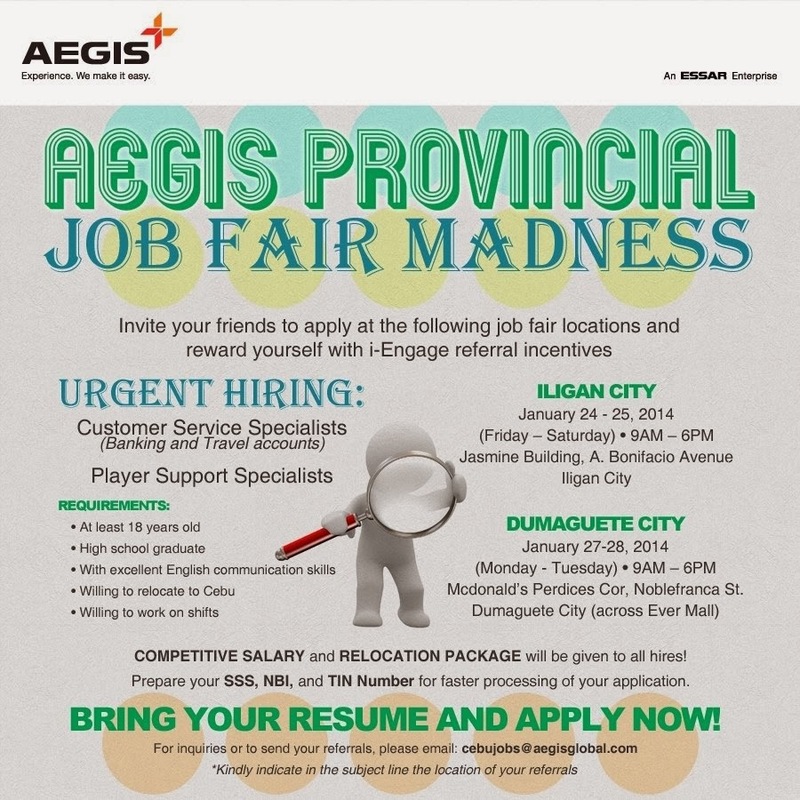 Catch and join in the AEGIS Provincial Job Fair Madness in Dumaguete City! Aegis will invades the City of of Gentle People - Dumaguete City on January 27-28, 2014, (Monday and Tuesday) 9am-5pm at McDonald's perdices Cor, Noblefranca St. Dumaguete City (Across Ever Mall). Bring your resume and mark your calendars and See you there! Competitive Salary and Relocation Package will be given to all hires! Prepare your SSS, NBI and TIN number for faster processing of your application. Visit Aegis Careers in Philippines Facebook page for more details and latest updates. The SM2SM Run 4 is on! Now on its 4th year! 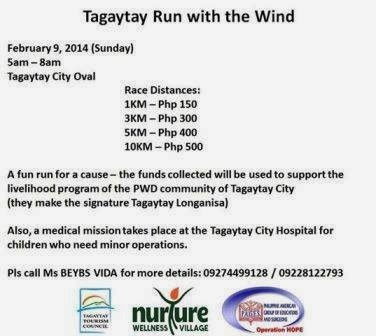 Inviting all runners to join! 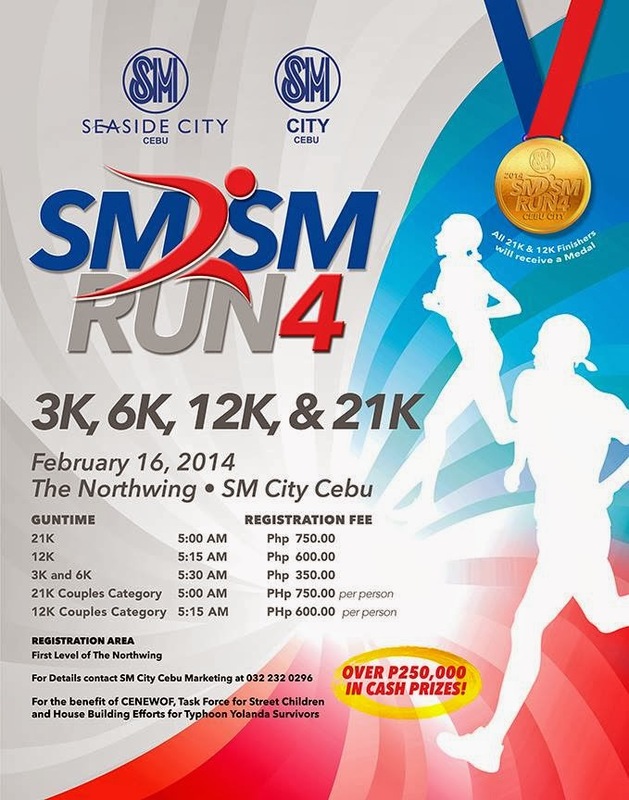 The race starts in SM City Cebu, goes through SM Seaside City and ends in SM City Cebu. On February 16, 2014, 4AM. The event will be giving away over Php 250,000 in cash prizes to those top finishers. Registration is ongoing until January 31, 2014 for 21K and 12K, until February 9, 2014 for 3K and 6K. Registration booth located at the first level of the SM City Cebu Northwing Atrium. Visit SM City Cebu (Official) Facebook page for more details and latest updates. Aéropostale will be on SALE!! 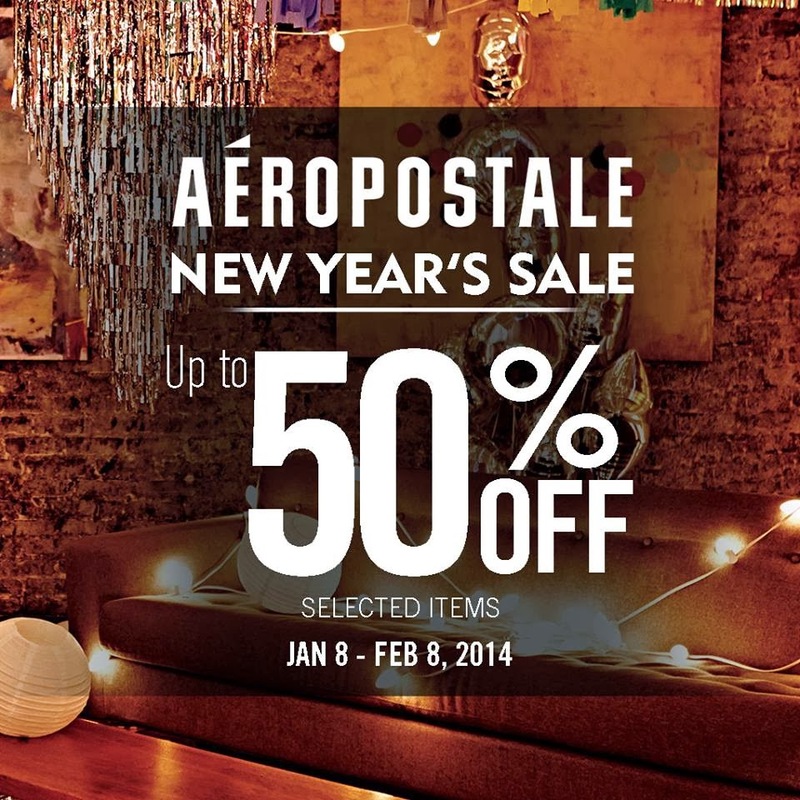 enjoy Aéropostale New Year Sale 2014! Giving you up to 50% off on selected items until February 8, 2014 only! Share this news to your family and friends! See you there! Original Penguin End of Season Sale! Enjoy great deals up to 70% off! Until January 31 ,2014 only! See you! Visit Original Penguin Philippines for more details and latest updates. Oriang by Café de Bonifacio, G/F Fiesta Market Extension, Market! Market! 32nd Street corner C5, Fort Bonifacio, Taguig City. 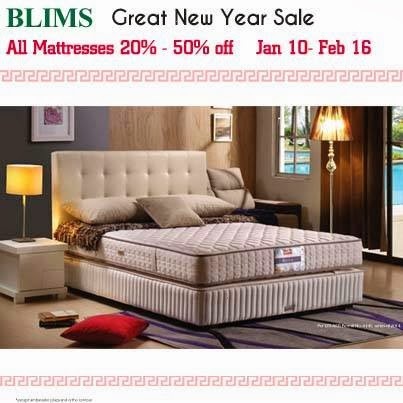 Shop from January 10 to Februaury 16 at all BLIMS stores and get BIG discounts up to 50% plus 20% to 50% off on all Mattresses. BLIMS Fine Furniture are giving away Free LUCKY MONEYTREE for minimum purchase of P20,000. Visit BLIMS Fine Furniture Facebook page for more details and latest updates. Visit Magnus Eventus Facebook page for details and latest updates. Nothing like a sale to brush off the weekday blues. Head on over to Celine and add another pair or 2 to your shoe collection. 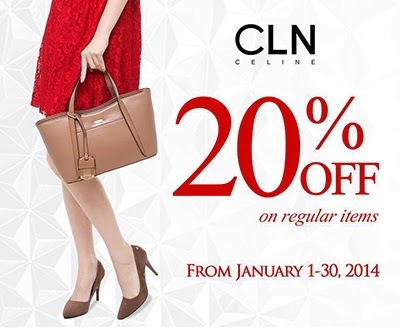 Get 20% off on regular-priced items from shoes, bags, apparel, and accessories. Head on over to SM Mall of Asia Official now! Visit SM Mall of Asia Official Facebook page for more details and latest updates. Enjoy the LG Mobile NEW YEAR SALE 2014 and Get crazy discounts on the stylish LG Optimus L Series II Android smartphones from LG Mobile! 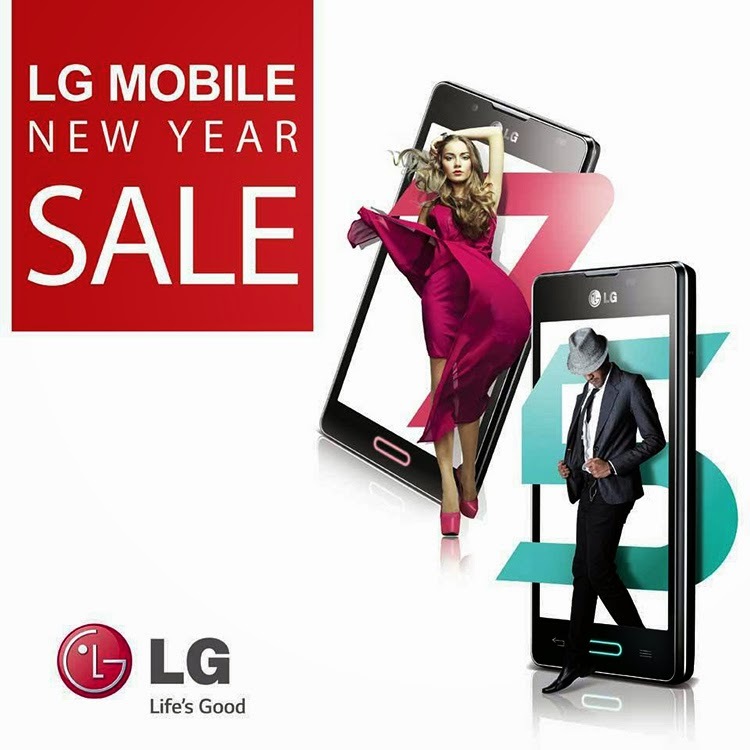 Catch the SALE in LG Mobile dealers nationwide! Visit LG Mobile Philippines Facebook page for more details and latest updates. It's National Autism Consciousness Week! SM Supermalls with Autism Society of the Philippines invites you to support our friends with Autism. Join us this Sunday, January 19, 2014, 7:30AM as we Walk with Angels at the MOA Arena. Attention BeAT owners! GOOD NEWS for you! 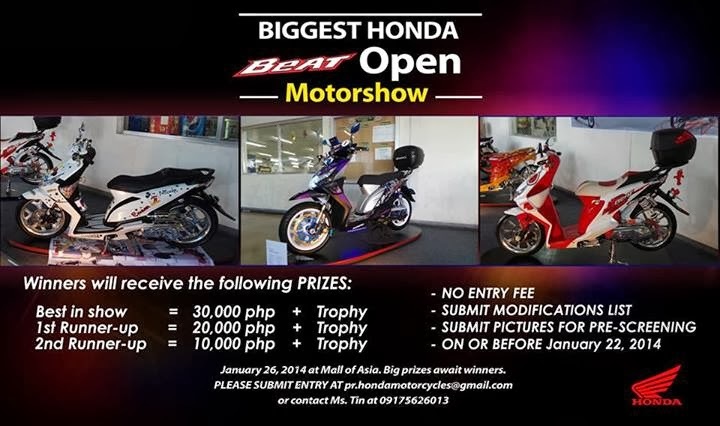 Come and Join the biggest Honda Beat Open Motorshow 2014 that will happen on January 26, 2014 at SM Mall of Asia. Big prizes await winners. Please submit entry at pr.hondamotorcycles@gmail.com or contact Ms.Tin at 09175626913. Visit Honda Motorcycle Philippines Facebook page for more details and latest updates. 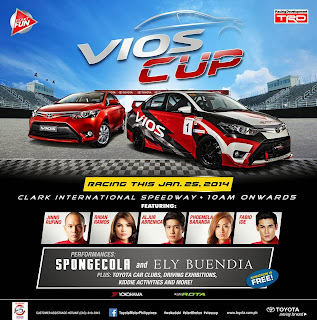 Toyota Motor Philippines announces the new schedule of the much anticipated VIOS CUP! Get a chance to see your favorite stars compete wheel-to-wheel on Saturday, January 25, at the Clark International Speedway, Pampanga. Experience WAKU-DOKI or heart racing FUN with concert performances by Sponge Cola and Ely Buendia, food trucks, and go-karts to watch out for at this epic racing festival. ADMISSION IS FREE, join this great racing event from 10AM onwards & get ready to start the fun! 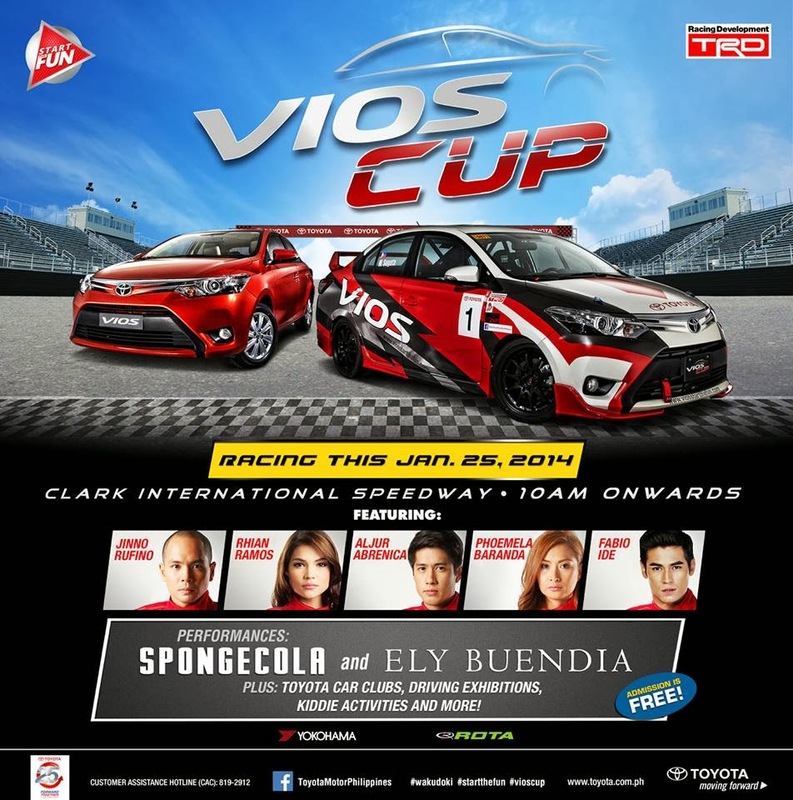 Visit Toyota Motor Philippines Facebook page for more details and latest updates. Good News for Jobseekers out there! 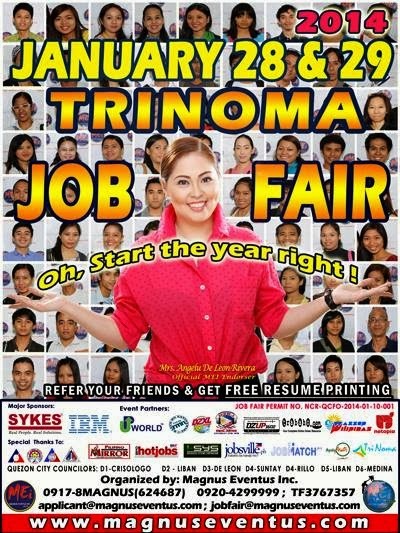 as Magnus Eventus Inc. presents Trinoma Job Fair 2014 on January 28 & 29, 2014 from 10AM - 5PM at Activity Center, Trinoma Mall, EDSA corner North Avenue, Quezon City. The event is particpated by more than 30 hiring companies from various industries from BPO, Call centers, manpower agencies, real estate companies, manufacturing, construction industry, skin care, fitness, IT company and lot more. This event is FREE ENTRANCE to all jobseekers. Attend and apply at any of Mega Eventus Inc (MEi) Mega or Exclusive Job fairs and Get your MEi Jobseekers Card for FREE! Refer your Friends and Get FREE Resume Printing. Visit www.magnuseventus.com for more details and Magnus Eventus Facebook page for the latest updates. Update now your resume! 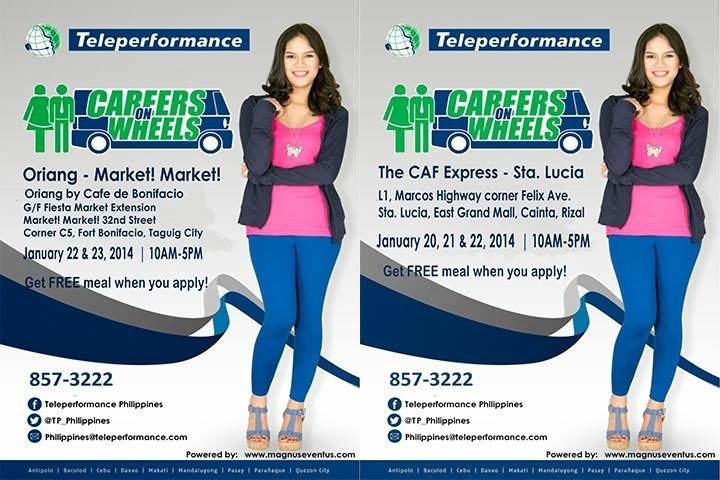 Come and Join as the BPO Career Hub invites you in The 8th National Career Fair 2014 happening at Glorietta Activity Center, Makati City on January 22-23, 2014, from 10AM to 6PM. The event will feature free career workshops and seminars, job opportunities and lots of giveaway items from participating companies. 2. Validate your account by clicking verification link sent to your email. 3. Complete your profile/online resume and start browsing and applying for jobs. Visit BPO Career Hub Facebook pagefor more details and latest updates. Islandexhibit link are inviting you to the Second South Job Fair! 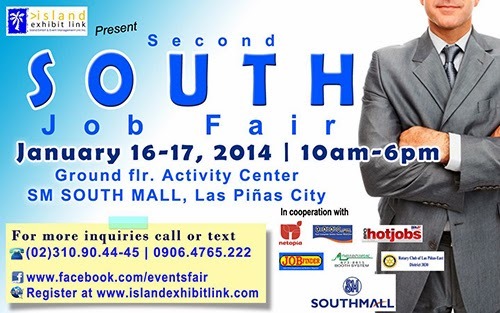 Career opportunities for all on January 16-17, 2014 from 10am-6pm at Ground Floor Activity Center, SM South Mall, Las Pinas City. 2nd South Job Fair in coorperation with Netopia, Trabaho.com, BPO Hotjobs, Job Finder, Ayther Events Expo Inc., Rotary Club Las Pinas-East District and SM Southmall. Visit Islandexhibit link Facebook page for more details and updates. PULP Live World presents PERIPHERY as they rock the Skydome, SM City North EDSA on February 6, 2014! Gates will open 6PM while the party starts at 8PM. Tickets are priced at P1,150 available exclusively at www.smtickets.com and all SM Tickets outlets nationwide. Visit SM City North Edsa Facebook page for more details and latest updates. 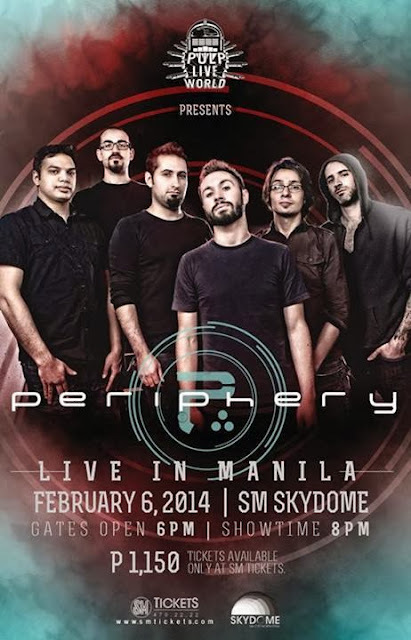 Periphery formed in 2005 and currently consists of Misha 'Bulb' Mansoor, Jake Bowen and Mark Holcomb on guitars, Matt Halpern on drums, and Spencer Sotelo on vocals. Since its inception, the band has been relentless its effort to have their music be heard. Allowing free access to almost their entire catalog, including over one hundred and thirty download-able songs, this self produced band is seeking to redefine the way music is experienced. 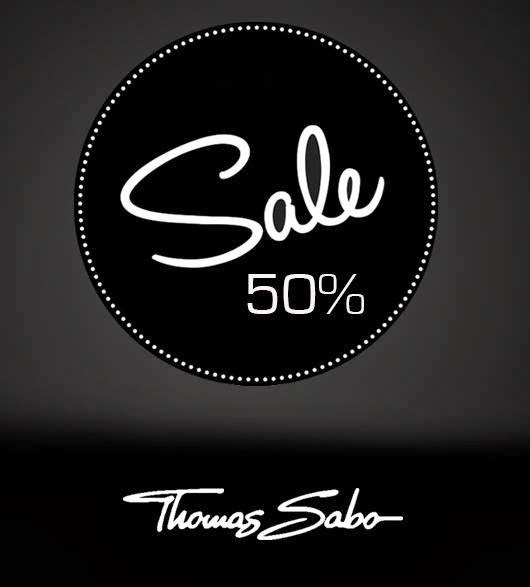 Glam up your new year with Thomas Sabo's End of Season Sale at SM Mall of Asia Official! 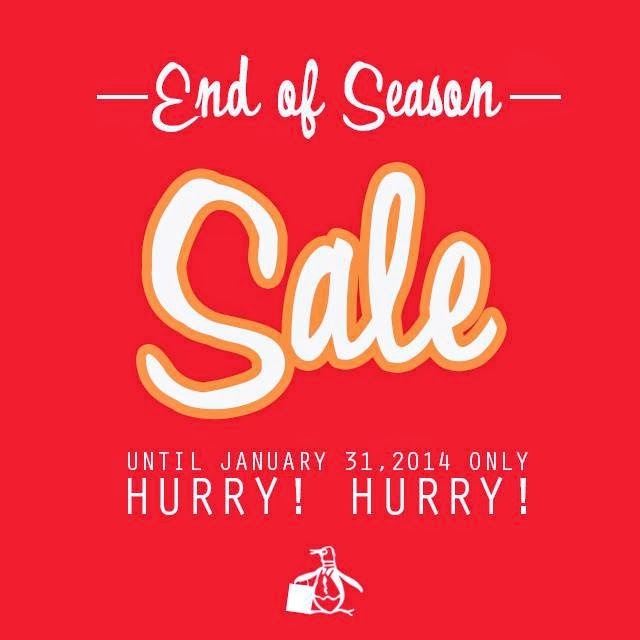 Get up to 50% off on selected items valid until January 31, 2014.See you there! Out with the Not-so-Old, and In with the Oh-so-New! 2014 starts off with a big BANG! as Sta. 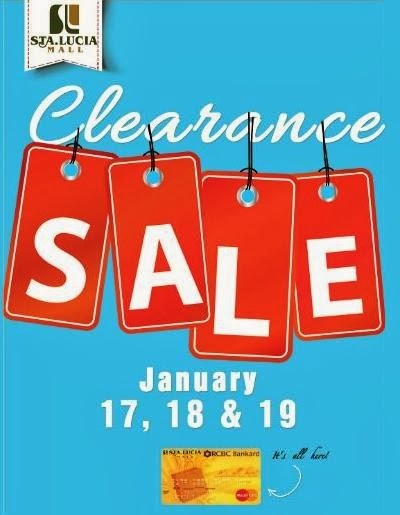 Lucia Mall ushers in its Grand Clearance Sale! With super low prices after the Holiday Rush, it's like Christmas all over again! Hurry over to Sta. Lucia Mall this January 17,18, and 19, 2014. Visit Sta. Lucia East Grand Mall Facebook page for more details and latest updates. Come and join as we celebrates Coco Festival 2014 @ SM City San Pablo with the theme "Sama-Samang Saya sa Bagong Sigla" and enjoy great shows and competitions! Visit SM City San Pablo Facebook page for more details and latest updates. Our favorite purple dinosaur's birthday is coming up! Let's celebrate this special day with Barney Birthday Bash Live in Concert @ SM Mall of Asia. Let's Meet & Greet Barney and enjoy Tee-rific games and surprses on January 11 at SM Mall of Asia Official Main Mall Atrium. 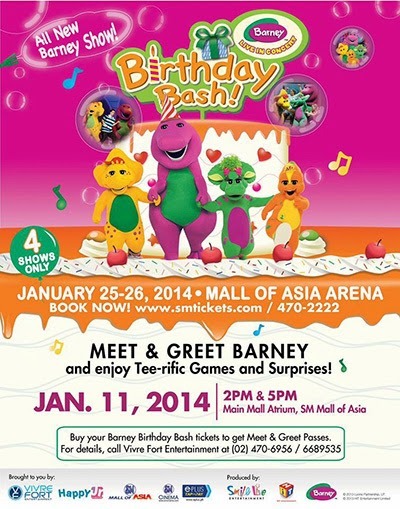 Catch Barney's birthday bash from January 25-26 at MOA Arena. Tickets are available at all SM ticket counters. Book Now! Visit SM Mall of Asia Official Facebook page for more details and updates. Mark your calendars! The biggest pyromusical competition will take a blast on first quarter of the year! The 5th Philippine International Pyromusical Competition will hold series of exciting fireworks display in Mall of Asia Grounds. 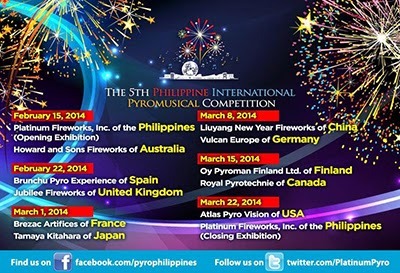 Visit Philippine International Pyromusical Competition (Official) Facebook page for more details and latest updates.